Here in Mallorca, we are lucky to have an enthusiastic audience of theatre goers. There are eight stages in Palma alone, ranging from the Teatre Principal to the Auditorium and from the Teatre Sanç to the Teatre del Mar. In the Part Forana, the hinterland, I know of not a single pueblo that does not have their own theatre or auditorium, from Inca to Pollença, from Santanyí to Andratx and from Manacor to Calvià. Tell me if I am wrong. I’d like to share with you a magnificent night out at the theatre, last night in Palma. 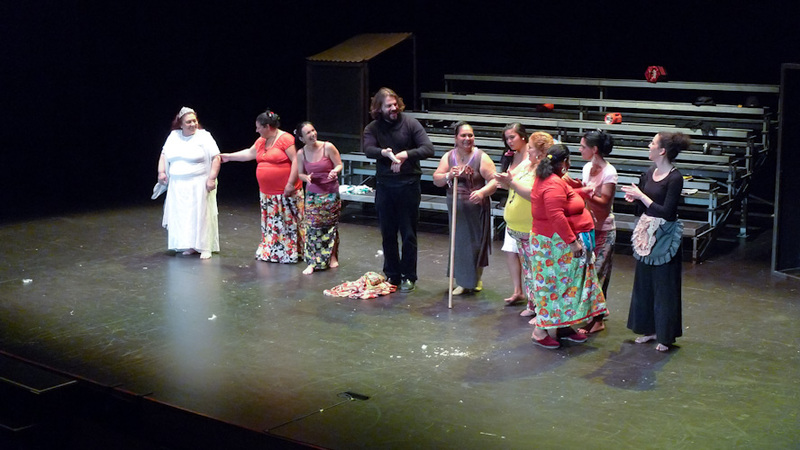 Eight Roma (gypsy) women were performing Federico García Lorca’s La Casa de Bernarda Alba. I had the pleasure of being invited to enjoy the all-female cast of real people without any professional background in theatre, some of them even without the ability to read or write, performing the last play that Federico García Lorca wrote in 1936, two months before he was brutally murdered during the Spanish Civil War. You probably know the plot involving Señora Alba ruling over her five daughters with domineering control. Inevitably, romance, love and death colluded to an ultimately fatal environment where people are not permitted to pursue their desires and passions. Unfortunately, the performance by the Centro de Teatro TNT group from El Vacie near Sevilla was a one night only event. The house was packed, and rightly so. In case you missed the occasion, here is a ten minutes snippet of the play, recorded in April 2011, with the same cast as last night’s performance. The photo was taken in Palma, Mallorca, Baleares, Spain. The date: February 29th, 2011. The time was 22:00:29. I’m fairly certain that there isn’t a theater in either Sóller or Fornalutx. I remember discussing this with someone there. It is surprising given Sóller’s artistic heritage. thanks for your comments. i think that you are right in saying that there is no theatre in fornalutx. but in sóller there is the teatre victòria de sóller, in carrer de la victòria, as far as i know. a mostra de teatre amateur de sóller was held there last year.